Walid beyk: “Eat my dirty knickers” ! I still recall the evening with Marcel Ghanem (a persona non grata in my humble opinion) where more than a couple of folders where laid on the table by Walid beyk’s side (another persona non grata) in the course of an interview. A promise was made by the so called leader of the Druze community, to one day unseal those folders, and prove beyond any reasonable doubt that the Syrian regime killed his father. Where are those files now, I wonder? Did Walid beyk decide to use them to feed the fire in his chimney in Moukhtara in order to keep warm knowing that the ton of “mazout” is about to reach the 900$ mark and times are tough? Or is it nothing more than a true reflection of the leech he really is? To those of you who had the misfortune to witness the Lebanese “civil” war”, I would like to remind you of the times when Walid Jr and Chamoun Jr (R.I.P) use to race cars in Hamra st and were clueless with regards of hereditary leadership. After his father’s assassination, this once rebellious son HAD to take over his father’s legacy and insure the continuous burning of the Arabic flame. Faisal (from the Arslan “rival” clan) was pushed aside thanks to the great efforts of Khawla for he was not a direct fruit of her womb, and Talal was too young (and in many ways, still is). Hence, Walid beyk became the most prominent representative of one the 18 Lebanese sects. Times came and went, people were displaced, Deir Al Kammar was besieged (his childhood friend’s fiefdom), reconciliation took place, and repentance was never said (especially not today). My fellow Lebanese and Druze I might add; how can you still rally behind such a fickle leader. Granted your other options are not so bright (Wahab and Arslan), but always remember you are Lebanese; and if your memory should fail you in that respect, then don’t label me a fanatic. Walid beyk is claiming to play a game of survival, your (the Druze) survival. But can you actually believe than when the other side reaches its long term goal (Wilayet Al Faqih), you would fit in? Take lessons my fellow Druze from Lebanon’s history, and know damn well that you are being used, and none of you will live to tell the tail. Just remember the 7th of May. Walid beyk : “Eat my dirty knickers”, and I am not a Druze; but I am LEBANESE. N.B: Where is Joseph Sader????? Although I am not dead yet (to the dismay of many) in am turning in my “future grave”, for nothing will never change. A deep feeling of resentment has taken over my soul; and I am convinced that once again I have taken the wrong turn in the crossroads that I thought were presented to me. At a very young age I thought, and for a very short lapse of time, that my cause was right and that it was a cause for survival; but I was wrong then. Then came a time in the hay days of the WMLL (world movement for the liberation of Lebanon) when I held my hopes high , foolishly thinking that it will remedy my past sins and make way for a brighter future. And not so long ago (after a very long period of non-belonging and living in limbo ) I wrongly thought that the time was ripe for a “Cedar Revolution” that will bring back a long lost dignity, which I (then) thought was craved by many of my countrymen. Once again I was wrong. Just like every decision I have ever made regarding this once Biblical (and no fanaticism intended) land of mine (and to some, maybe yours) has proven not only to be the wrong one, but the one that brought me closer to disbelief in the goodness of man. This motherland of mine has proven to be nothing but a cesspool for all that is evil. No I am not cursing, nor dissing Lebanon; but I am actually cursing and dissing the Lebanese. This unique creed of pretentious sheeple who put themselves even above their 18 (legally recognized) different notions of God. Today another nail in the coffin of what could have been (in order not to say “what was”) a great nation was hammered to the applause of many. But to those (like me) who had one last iota of hope left; it was another sad chapter in our quest for true independence, justice and the right to live free. Today I disassociate myself from all those who still believe in any form of dialogue with all, and anyone who disregarded the results of the past elections. And furthermore I dissociate myself from those who won (because of my vote and that of hopeful Lebanese) and bent over (just to get fucked) more than once in the past two years, to the extent that it became a habit. Your country needs you (the few remaining Lebanese) to get off your lazy arses and react. Say no to the current situation and do not wait for tents to be erected once again in downtown Beirut or for the airport road to be closed by mopeds and burning tires. Face the cold and stage a sit in in Dahieh, 3ein il tineh, Parliament square, Baabda palace; heck ABC and City Mall AND DEMAND YOUR RIGHT OF REPRESENTATION. Say no to ALL our political class, voice your disdain in public (for once) and DEMAND a radical change. Bidna n3ish you say? ASSUME ! اذا بتحب لبنان ؛ حبّ صناعتو! What is there to love inصناعتو lately I ask? Should I be proud of the proposed internet law; that is a blatant infringement on human rights? Should I be proud of the fact that I pay more money than any third world country for telecommunication services (and not even getting a decent service in comparison)? Should I be proud when President Suleiman, not only commented on the “defamation” issue on facebook, but gave it his approval? Should I be proud, when in the words of our esteemed minister of tourism, who tonight went on OTV and argued his plans for making Lebanon the tourist hub; omitted the fact that he has done his best to close down Gemmayze? Should I be proud of the fact that, on any given occasion like the world cup, Lebanese fire their weapons in the air causing death and go unpunished? Should I be proud when I see Iran giving up on their freedom flotilla to Gaza, and we try to go ahead with ours? Should I be proud that we are now finally talking about Palestinian’s civil rights, knowing damn well that Lebanese from different sects are not for it? Should I be proud that Lebanon is the safe harbor for all sorts of Arab terrorists (mainly within the Palestinian camps) and are being used for sectarian purposes? Should I be proud that the Cedar revolution fell short of ALL its promises, and we the people still follow blindly? Or should I be proud of the fact that Hizbollah has hijacked MY country and still we don’t revolt? Yes I am a proud Lebanese, regardless. I am proud of the Lebanon I once knew (with all its shortcomings and God only knows how great they were). Today I am not proud of his صناعتو , for it has led me to the Doha agreement and the total control of one group which does not have one iota of Lebanese patriotism. As a Lebanese, I feel that NO one represents me and that the worst is yet to come. The Cedar revolution has failed its followers; and those followers have failed Lebanon. Wake up and smell the cyanide my fellow Lebanese; for no one is going to grant you your rights for free. If ever you want to reclaim this land of milk and honey, you have to act; call a spade a spade and be willing to bear the consequences. No one can, or should be able to silence your voices and your quest for freedom. ASSUME, for you have a duty, if not towards yourselves, then towards your children and this future generation. Commemorating a lesson NOT learned ! No matter how hard you try (especially my generation) to move forward and turn the page, the (bloody) past has a knack to come back and bite you in the arse. On the 13th of April, and for a few years now, this holier than thaw attitude has been the subject of competition between the “competing” local TV stations ,which are the bullhorn of most militias whom I hold responsible for the death of 150000- 200000 fellow Lebanese. Amazingly enough they all seem to agree (wrongly) on the image of Ain El Roumaneh bus as the start of all evil that cursed this Biblical land of ours. In order to keep this latest rambling of mine short, I might grant all those who believe in this fallacy the pleasure in dwelling in this false pretext for the (according to me) war started with the Imposed signature of the Cairo treaty and the “flint” was the Kissinger plan. Call me a conspiracy theorist or even a moron, but this was, and still is my conviction. On the eve of the 13th of April, I do not want (or at least I try not to) lay the blame on anyone anymore. On the eve of the 13th of April I wish for this new generation to finally draw lessons from our bloody past. This same generation I am referring to, is being brought up in an environment more entrenched in sectarianism and fanaticism then I ever witnessed in the late 70’s when I was still a teenager. Before the war broke out (because of the bus incident or not is now irrelevant, but not to me) teenagers did not (in general) pay much attention to religious following according to family names. My generation, intentionally or not, made the divide even greater. Rebellious teens found a new slogan to use against their parents, such as “la lil ta2fiah” which they proudly put as bumper stickers on their cars; but when push came to shove they were more than happy to use derogative terms towards their fellow citizens. Friends of mine published a humorous blog on their page, which prompted me to write tonight. It is not the contents as such, but the mere picture of the Holiday Inn hotel, and the vivid memory of a man plunging to his death trying to evade an even worst fate. What followed I will spare you, for it is too painful for me to recall, although many have lived even worst. And you think that we have learned our lesson. How can we; when we are still harboring all sorts of banned fanatic clerics, mullahs, terrorists, Schizophrenics child murderer (Samir Kuntar), convicted murderers (Ahmad Gibril), strive towards peace, prosperity and most of all security for our children. All those who died during the 15 years of “civil” war are turning in their graves. One example will suffice, and that of the man who threw himself from the Holliday Inn and is now rotten in his grave watching goatee Saad shake hands with Geagea. And this is only one example. 15 years of war and 150000- 200000 martyrs never would they have shed (in their majority) their blood if they knew that Hassouna will be the ultimate dictator treading the same grounds they are buried under. Even the Imam Moussa Al Sadr is turning in his grave. I sure hope that the day will not come when we will commemorate the 7th of May as the day when HIzbollahistan was born. The drums of war are beating loud. The drums of war are once again beating loud on all sides of the fence waiting for one side to cross the red line. All sides agree that if there is to be war, this time it has to be decisive. Casualties of war are no longer considered, for the only aim (according to rhetoric, from both sides) is to obliterate the enemy. Although the feuding families in this tragedy are not only the Capulet and the Montague, but also their cousins (thrice removed) the Assad, Ahmadinajad, Nasrallah, Obama, Sarkozy,Brown…etc. I will only dwell on the impact this coming war will have on a little chapter better known as Lebanon. I figured, after monitoring local and foreign press that the day of reckoning is fast approaching. I figured this out from various speeches (threats) from both south and north of the border neighbors, and from our local “divine” protector. A simple call (past Thursday) to readiness from the supreme leader of the masked epitome of evil (Ahmadinajad) to our enlightened “divine” protector; assured me that very soon the “divine” himself will test our faith (according to the seven pillars) and lead us straight to heaven. But I am still convinced that my time to meet my creator (who might not be recognized by our “divine” protector) has not come yet, not by miles. “To Jerusalem and beyond” is my embedded crest for I have fought (along with Richard the lion heart) the heathen before you could even claim an inch of this BIBLICAL land. When the next war will come; and I pray for the sake of my son (and not yours), that I will not, I will close my door to you and your people who will be seeking refuge. Provoked or not, for you and your bravado, have brought it, not only onto yourselves, but onto this entire nation. I will go even further and say that I will hold you and those who (blindly) follow you responsible for every single drop of bloodshed, no matter how disproportionate the response might be. Hassan, you hold no respect, nor value for the living. The only way you can justify your (and your militia) existence is through your outdated notion of jihad even stretching outside local borders. From once “downtrodden” to now the example of what defaces this country, I not only claim that you are a traitor to Lebanon, but also to what IS a religion of the book which is supposed to professes love and tolerance. When the next war breaks out, let arse lickers like Saad, Walid, Nabih, Suleiman, Karameh..etc open their doors to your followers (you will be, like expected, hiding in you bunker) welcome them; giving them the front row seats to watch Lebanon and its majority of peace loving people being burned to ashes. But then again you might think why not, wads of cash (and only “halal” cash) will come from your sponsors to rebuild on an even better standard. So I guess you are only contributing to making Lebanon a better, nicer place. No thank you very much. Keep your Samir Kuntar, Imad Moughnieh, Bilal, Abou salam, Abou Turab, Abu Ali…etc, to yourselves. I can cite hundreds, if not thousands of: Joseph, Antoine, Georges, Samir, Ziad, Mohamed, Constantine, Mitri, Walid, on different sides of the (local) fence who gave their life for Lebanon, but not for “wilayat al faqih”. Ya Hassan, do not give me a lesson in patriotism. The Lebanese courts passed the death sentence less than a couple of weeks ago on 3 traitors working for our arch enemy Israel. They should at least convict you, if lenient, for involuntary manslaughter for what you did in 2006. Wake up you orange flag branding morons, your leader’s stupidity has given our “divine” protector legitimacy to push us further into the abyss. No Micho is not the second coming of the Christ, he is more like David Koresh and Wako II is Rabieh ! St Valentine, or M14’s fallacy ? Not only have we invented the “ourjouwan” color or the alphabet; but we Lebanese are pioneers in many fields. No wonder we are proud people (and so rightly so), Lebanon was mentioned 71 times in the Bible; and if Belinda Carlisle knew Lebanon, her song “heaven is a place on earth” would not have been written as a love song, but as a tribute to our country. We (Lebanese) are direct descendants of God (ou meme la cuisse de Jupiter, depending on your religious beliefs). 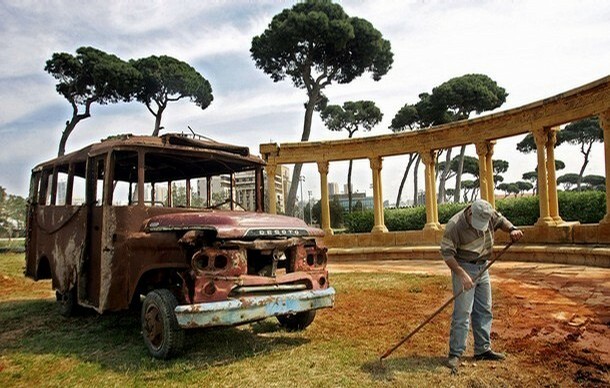 Lebanon is the true Garden of Eden, where it all began, and where it will all end. The notion some have that the Jews are the chosen people is nothing but a fallacy, a few millimeters on a geographical map, shy from the truth. We are the chosen ones! Today we Lebanese have once again demonstrated to the entire world (and maybe the universe) that we are true pioneers; pioneers in having taken the art of absurdity, no worthiness, sold out bunch of ingrate selfish bastards, mindless “sheeple”, brainwashed pretentious narguilleh smoking selfish lazy wannabees arses. The sight of goatee Saudi Saad waving his hand in salute as if he was the queen of England (and a queen he might as well be) grabbing Walid beik by the waist (obviously against his will) made sick to my stomach. The songs playing in the background and the festive mood on what should have been a grim reminder of our bloody (recent past) made my blood boil. And they (M14) have the audacity to talk about their achievements in the past 5 years. The Cedar Revolution is dead! It officially died after the June elections when promises were broken one after the other. The Cedar Revolution was never the sole proprietorship of any political party, it was a movement from the people and TO the people, entrusted then (wrongly) to the current leadership. Today another nail (if not the final one) was put on its coffin. Today, I and the entire world, witnessed the shrinking of your (M14) power base; and in a couple of days from now the entire world will witness the ever constant (if not growing) power of Hizbullah (the commemoration of their martyrs). And yet THE supreme leader of M14 (goatee Saad) deemed it fit to announce to the world (not very long ago) that the government will stand by Hizbollah in case of a new “aggression” (even if provoked) against Israel. If only I was allowed to (safely) attend the Hizbullah commemoration, for I have more respect towards those who even if they have an agenda that I totally refute, are true to their promises and their following. Sad to say, I hold MUCH more respect to those I am willing to dedicate my life to fight against their vision, than to the lot of you (M14). Come next elections, not only I will not vote for you; I will vote against you. Long live Imad Moughnieh and may God protect Samir Kuntar !